The ancient Gitxsan village of Kispiox (right) is located at the junction of the Kispiox and Skeena Rivers in northern British Columbia (BC). 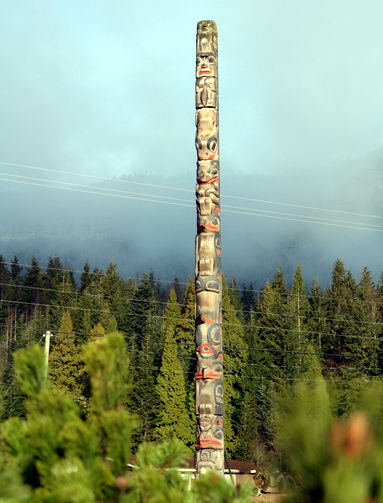 The totem poles at Kispiox are documents of sovereignty and attest to Aboriginal Title and Rights, as articulated in 1977: "Since time immemorial, we, the Gitxsan and Carrier People of Kitwanga, Kitseguecla, Gitanmaax, Sikadoak, Kispiox, Hagwilget and Moricetown, have exercised Sovereignty over our land. We have used and conserved the resources of our land with care and respect. We have governed ourselves. We have governed the land, the waters, the fish, and the animals. This is written on our totem poles. It is recounted in our songs and dances. It is present in our language and in our spiritual beliefs. Our Sovereignty is our Culture" Gitxsan Carrier Declaration. 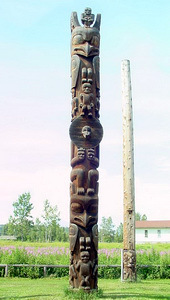 Totem pole in Kispiox, 2007. 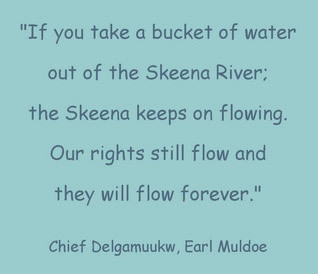 Chief Delgamuukw made the above statement following a court ruling on 25 June 1993 that was part of a decade long landmark Aboriginal Title and Rights case initiated in 1987 by the Gitxsan, apart from the Gitanyow who pursued their land title independently, and their Bulkley River allies, the Wet'suwet'en: Delgamuukw Decision. The Skeena River Watershed is the home of several First Nations who share a common culture as well as a legal system that defines ownership of the territory and access rights. Totem poles are an integral part of this indigenous identity and history. 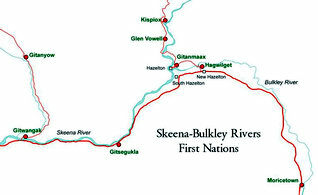 Some of the First Nations tribes, or villages, presented here are: Kispiox; Kitsegukla (Gitksigyukla); Kitwancool (Gitanyow); Kitwanga (Gitwangak); Kitanmox (Gitanmaax); Kitsekalum (Gitsmgeelm); and Kitselas (Gitselasu). 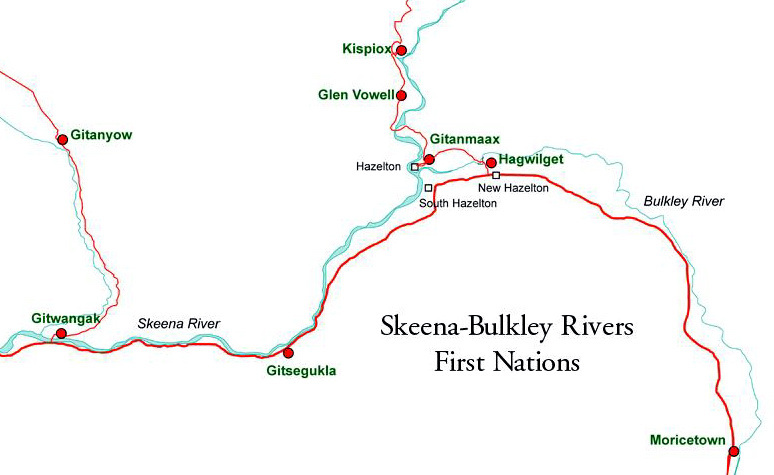 First Nations of the Skeena River Watershed (above) have invested their homeland with complex meanings that are central to their identity and culture. Following the European invasion, the First Nations have fought for the recognition of their land title, collective rights and traditional names, crests and matrialinear inheritance. The colonial exploitation of indigenous resources has been ongoing since a sawmill was set up at Kispiox in 1898. A century of industrial clearcut logging has largely destroyed the ancient forestlands on the Skeena River, yet the practice continues today (right). In an act of repression, the BC government opened up Gitxsan land to the timber industry in 1905. When Kispiox and Kitwanga chiefs responded by stopping road building, many were arrested. In 1908 the chiefs travelled to Ottawa to present a petition protesting against the stealing of their unceded land. When the railway invaded Gitxsan Territory in 1909 many fishing sites were destroyed on the Skeena, with no compensation to Gitxsan for their loss. Further protests were staged followed by mock government trials of the Gitxsan activists and subsequent imprisonment. Increasingly in the 1980s the Gitxsan fought for sovereignty. In addition to filing legal claims of ownership and jurisdiction, they set up road and railway blockades. In 1988 chiefs led five one-day blockades in the Kispiox Valley to protest the extraction of timber from Gitxsan Territory. Many further blockades against logging and right of way through reserves followed. On 2 February 1995 the Gitxsan set up a blockade 15 km east of Hazelton on a logging road at the Nangeese River to protest against unresolved land claims, timber licences and clearcutting. The protest included Gitxsan main speaker Anuthlem Buhn, totem pole carver Sim'oogit Geel (Walter Harris), and Kispiox Watershed Protection Coalition spokesperson Margaret Clay (right). Logging road and clearcut, 2006. Left: Wet'suwet'en David Dennis is seen dressed in traditional regalia, a button blanket robe and bird headdress, standing next to a painted totem pole at the Bulkley River community of Moricetown (Kya Wiget) in 1950. Totem poles played a crutial role in the land claims case by Chief Delgamuukw and Chief Gisday Wa. The son of a prominent chief, David Dennis was raised in a traditional longhouse in Kilwoneetzen territory which was burned down by white miners. 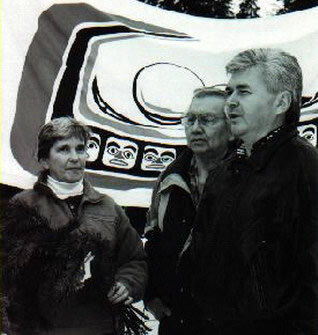 His brother in law was Chief Johnny Dennis (Maxlaxlex), who gave evidence to the Delgamuukw commission in 1985 and 1986. His fascinating testimony, with many references to totem poles, was given in his native language. It was recorded in the 2005 book by Antonia Mills: Hang on to These Words. Right: Cover of the book by Marius Barbeau published in Ottawa in 1929 (click to enlarge). "This art now belongs to the past. Ancient customs and racial stamina are on the wane everywhere, even in their former strongholds. Totem poles are no longer made. Many of them have fallen from old age; they have decayed and disappeared. Some have been sold, cut down, and removed to museums or public parks." Left: Article by M. Barbeau, published in 1932: "Totem Poles: A Recent Native Art of the NorthwestCoast"
Barbeau was wrong in his 1929 assessment that totem poles was a bygone artform (left). 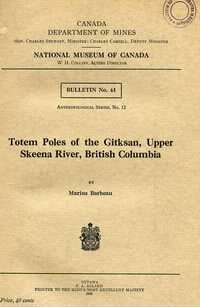 When he conducted his research in BC, from 1914 to 1920, the most intact totem pole collection was that of the Gitxsan, which consisted of over 100 poles in eight tribal villages of the upper Skeena River. 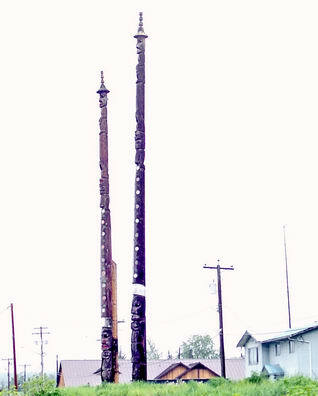 Barbeau described 109 of these poles, noting that they were among the tallest in existence, some up to 60 ft in height. Fallen totem pole, Kitsegukla, 2006. "Kispiox Village." Painting by Emily Carr, 1929. 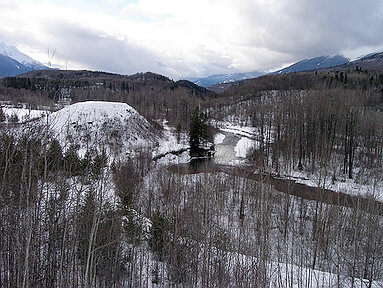 Archaeological records show that many canyons and junctions on the Skeena River were inhabited since ancient times. Kispiox (left), known as "People of the Hiding Place," is one of six Gitxsan communities with totem pole collections. "There are approximately 25 totem poles that are privately owned by House Groups. Some date as far back as 1880 and as recent as 1995. The much — admired Kispiox totem poles stand in the grass at the edge of the community where the Kispiox and Skeena rivers meet. 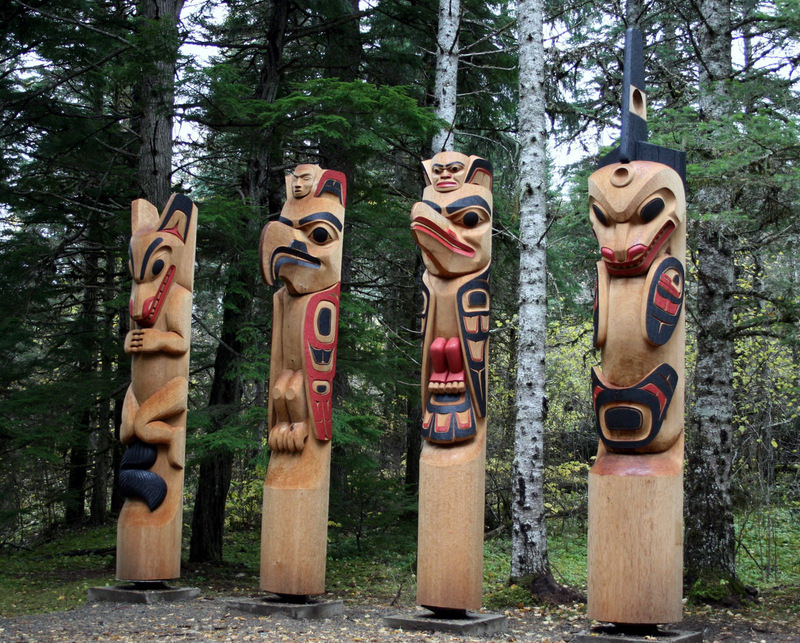 Carved with Eagle, Raven, Frog, Killer Whale, Bear, Wolf, and Human figures, they commemorate the dead, signify ownership, and offer insight into the heritage of the local people. The characteristic figures on totem poles are symbols comparable to family crests. They illustrate historical events that occured in a House's past. If the historical event involved several houses, those Houses may share the crest." "The pole's owners display their crests on the pole to establish and make public their claims to vested rights and privileges. They varied with each family; they were exclusive property and were guarded. Each carved illustration on the poles serve a multiple purpose: besides commemorating the dead and showing ownership, they familiarize youths with their histories — keeping part of our heritage alive" Kispiox Totem Poles. 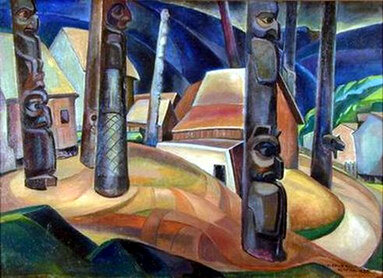 The village of Kispiox was painted in 1929 by the early feminist artist Emily Carr (above). She was one of the first to grasp the compelling power of the totem pole as an art form: "The oldest art of our West, the art of the Indians, is in spirit very modern, full of liveness and vitality. . . The foundation that the Indian built his art upon was his Totem. He did not worship it, but he did reverence it tremendously. Most of the totems were animals representations, thus animal life played a great part in the life of the Indian and his art" Emily Carr, Fresh Seeing, 1930. Following an especially bad epidemic in 1862, when small pox claimed 30% of the Gitxsan population, in the 1880s the aboriginal communities of Skeena River were forcibly removed onto Indian Reserves. The people of Anspayaxw "the hiding place") were renamed the Kispiox, or "loud talkers," by colonial government officials to identify their village as a notorious "head centre of disaffection," where intrusions by settlers — telegraph lines, Indian reserves, wagon roads, fishing restrictions, mining and logging operations — were vigorously rejected. The admirable resolution of the Kispiox people to defend their territory from colonial takeover is embedded in their poles. 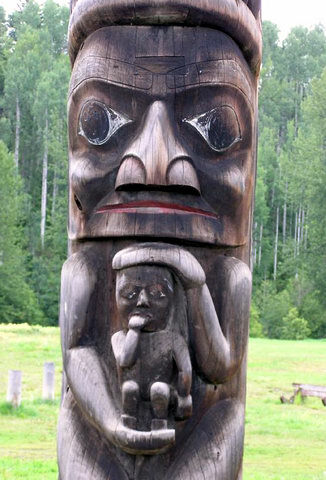 The bottom figure of a pole carved by Walter Harris depicts a Gitxsan legend about a time of famine, when a 'weeping woman' holds a grouse to her chest, caught too late to save her brother from starvation (right). 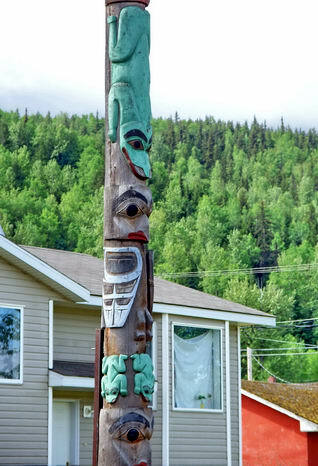 Totem pole at Kispiox, 2008. Far left: Photo of Kispiox poles taken in 1909. In the background is the White Owl Totem Pole. Erected in 1845 as a memorial to a chief named Gitludahl, it was one of the oldest in Kispiox. In the foreground, is a totem pole raised some 40 years later, named Grizzly Bear of the Sun for another chief of the same name. It was carved by Tsugyet of Amagyet (James Green). Both poles are now gone. Middle: Painting of the Grizzly Bear Pole by Emily Carr, 1928. Painted from the original pole in Kispiox. Left: Photo of the totem pole carved by Earl Muldoe which combines the crests from both of the old poles. Raised in Kispiox in 1975. Kispiox carver Earl Muldoe, c. 1985. The Delgamuukw Decision was reached on 19 December 1997 by the Supreme Court of Canada. After a decade long legal battle, it determined that Aboriginal Title was not extinguished by provincial legislation. The court recognized and began to define aboriginal title, and ruled that Gitksan "adaox" and other oral histories must be given weight in determining land claims: Delgamuukw Decision. By the time of this decision, the original chief known as Delgamuukw, Albert Tait, had died and the title passed onto Kenny Muldoe. 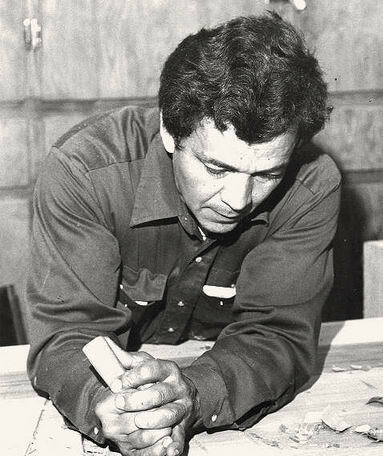 When he died, the title passed down to Earl Muldoe (above), a Gitxsan carver who was born in 1936 in Kispiox and trained as a totem pole carver at 'Ksan. Two commissioned totem poles by Earl Muldoe are on display at the Plaza of Nations in Vancouver. They are depicted in drawings (right). One depicts the Nanasimget story of the Whale, the other is topped by a Watchman figure. Both totem poles include the family crests of the carver who says: "I personally selected the logs I wanted to use. These are old growth cedars, with scarcely a knot on their entire length"Public Art Registry. 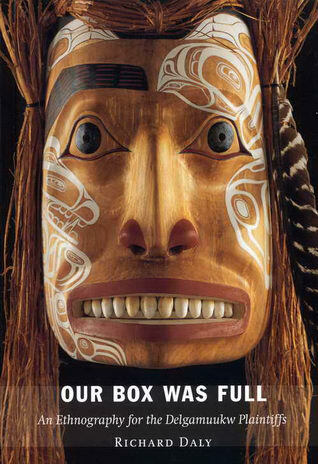 The importance of preserving primaeval forests for the perpetuity of Northwest carving traditions would seem obvious, yet non native experts on totem poles fail to make this connection which is misconstrued as partisan advocacy. Drawings of totem poles by Earl Muldoe. For an informed study on how the Gitxsan and Gitanyow assert the ownership of their territory according to their own legal system, using the ancient oral history of "adaawk" and their knowledge of the territory and its geographical features to establish their title to lands in the upper Nass watershed, see Neil Sterritt, et al: Tribal Boundaries in the Nass Watershed (1998). This work, by the researchers who prepared the Gitxsan testimony for the Delgamuukw court case, challenges the massively overlapping claim of the Nisga'a Nation. Read a review: Brian Thom. 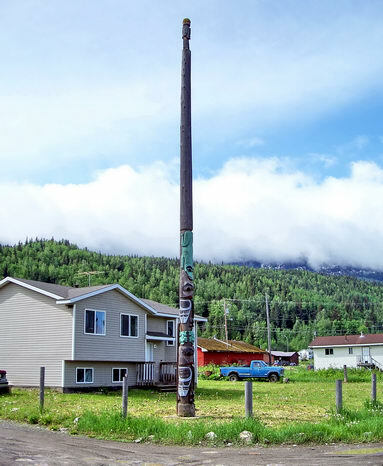 Home to legendary Gitxsan hero, Simon Gunanoot, Kispiox has long been a centre of resistance and the totem poles here continue to assert Gitxsan sovereignty today. Some iconic poles have been widely copied, such as the one with a figure sticking out its tongue (left), a gesture that shows the transfer of knowledge or power. "Art is my life, and the life of my people. I want my work to live and carry on the rich tradition of our people. I have always felt the importance of passing on my knowledge and my skills. . . Our art connects us to our past and intertwines us in the present and makes way for the future" Walter Harris. Right: "Simogyet Geel" (Click for pdf). Tribute to Walter Harris written in 2001 by George MacDonald, Canadian anthropologist and museum director who pioneered archaeological and ethnohistorical research on the Tsimshian and Gitksan and was the director of the Canadian Museum of Civilization from 1983 to 1998. RIght: Leading In pole by Walter Harris, 1972. Gitxsan Walter Harris, also known as Simogyet Geel, was a respected hereditary Gitxsan chief and carver (above). 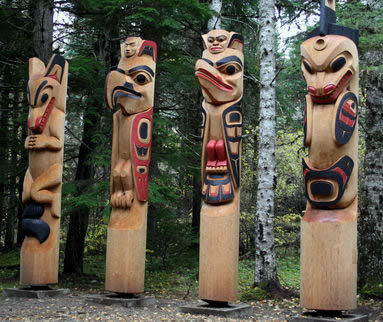 Of the totem poles that lie at the heart of Northwest Coast art, Harris said, "They are our deeds to the land. They serve as witnesses to the encounter of our ancestors with the supernatural beings who control all the fish, animals and plants in our world. They are our charter of rights from time immemorial." 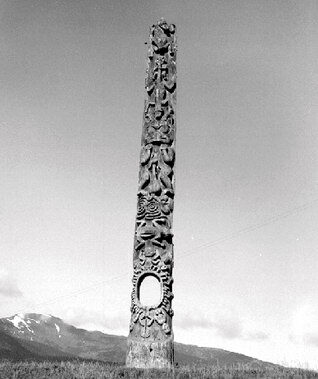 Assisted by other carvers, in 1972 Walter Harris raised one of the first poles in recent times, a major ceremonial event at Kispiox attended by high ranking chiefs from afar. The ancient crest called Leading In, with a human like face and a very large mouth is respresented on the lower half of the pole (left). Harris explained: "Every Gitxsan family 'owns' land and has the duty to use and share their lands. The Chiefs and their people must also protect that land, and the land of their neighbors. . . Totem poles are like an umbilical cord to the land. 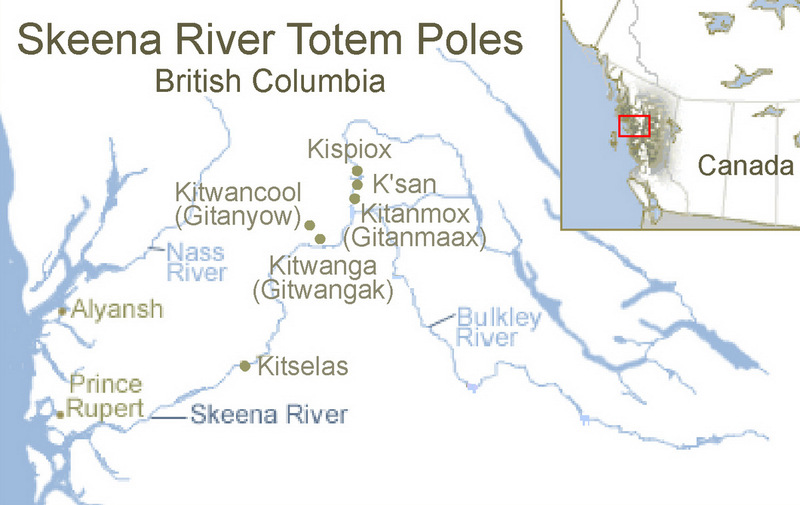 Histories of the families and their lands is what is shown on Gitxsan totem poles." 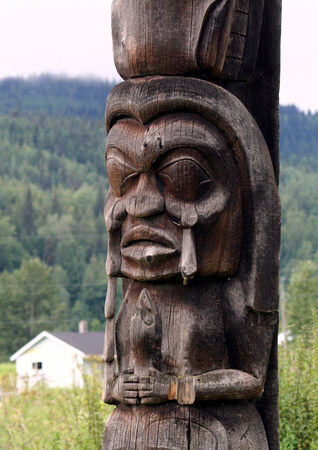 A founder of 'Ksan Village, Harris is perhaps best known for the poles that stand outside Vancouver Airport, carved with Earl Munroe in 1990. Right: Book cover, Our Box Was Full: An Ethnography for the Delgamuukw Plaintiffs by Richard Daly (2004). From the introduction by Bruce Granville Miller: Anthropologist Richard Daly "gave the most extensive ethnological expert opinion regarding Aboriginal rights and title ever heard before a Canadian court in the landmark case known as Delgamuukw (decided in 1997). This evidence was given on behalf of the heads of the Gitksan house chiefs and members. This First Nation, together with the neighboring Witsuwit'en, began to negotiate a comprehensive land claim in 1977 and, making no progress, entered into the litigation process in 1982." "Daly writes that the two decades after the trial process began have yielded unproductive treaty talks, and the pattern of removal of wealth (in the form of natural resources) from Gitksan and Witsuwit'en territory continues. Meanwhile, the litigation process has changed perceptions such that what was once seen as a system of fluid, ongoing social relations has now come to be seen more as immutable truths. . . In the form of lengthy oral histories given by chiefs to the courts, the Gitksan and Witsuwit'en provided the richest accounting in Canadian — and perhaps contemporary world — history of their communities, yet they still suffer from the effects of misunderstanding and reification." 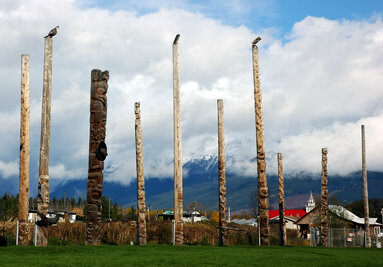 Today the totem poles of Kitsegukla stand as powerful village sentinels that communicate and assert the ancient Gitxsan connection with the spirits of the land (above). The astonishing height of some of these poles can be seen by comparing them to the adjacent telephone poles (right). In 1936 the Skeena River flooded, causing much damage to the First Nations communities along its shores. 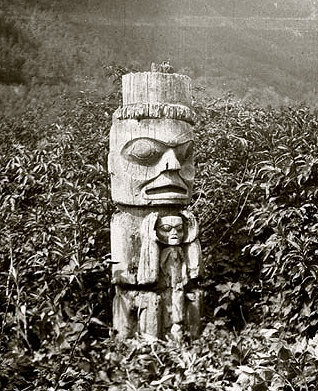 Along with the houses, many totem poles were destroyed. 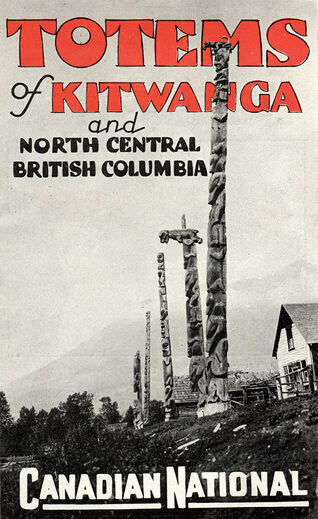 A restoration effort began in 1942 when the people of Kitwanga re-erected three poles; in 1944 the people of Kitwancool restored several fallen poles; and in 1945, the village of Kitsegukla re-erected five totem poles. 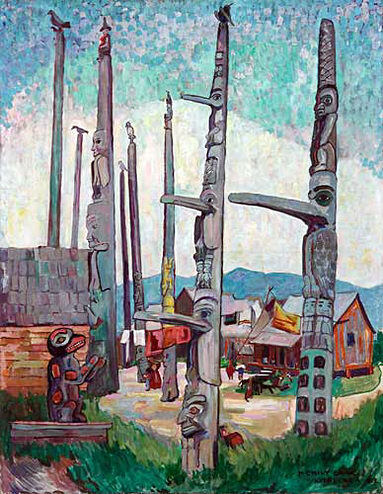 Emily Carr depicted the remarkable totem poles at Kitsegukla in 1912 (above, left). A photo taken by George Emmons in 1910 (above) shows a young Gitxsan boy with his dog standing in front of a totem pole that belonged to Ksraromlarhae. 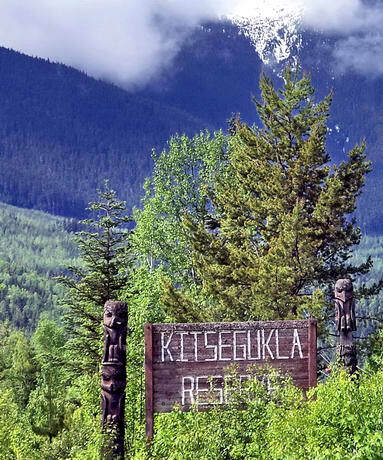 The village of Kitsugukla was the site of an early blockade by the Gitxsan. Miners travelling up the Skeena River to the Cassiar Gold Rush in 1872 passed through Kitsugukla and a fire started by the miners destroyed 12 village longhouses and six totem poles. 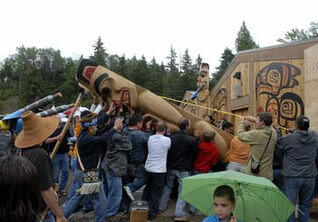 Kitsegukla chiefs demanded compensation and blockaded the Skeena River to press their demands. The government feared that the protest would prevent river transport and it send navy gunships to intimate the Gitxsan. Kitsegukla was at the centre of a native revolt in 1888 that was widely reported, also in the international press. 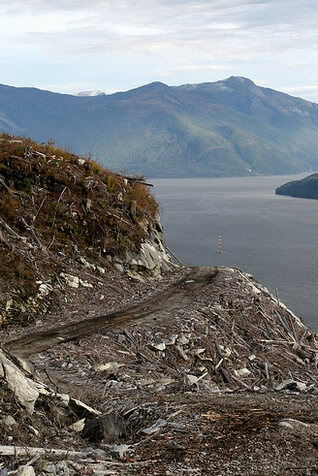 See the New York Times: Skeena River Revolt. 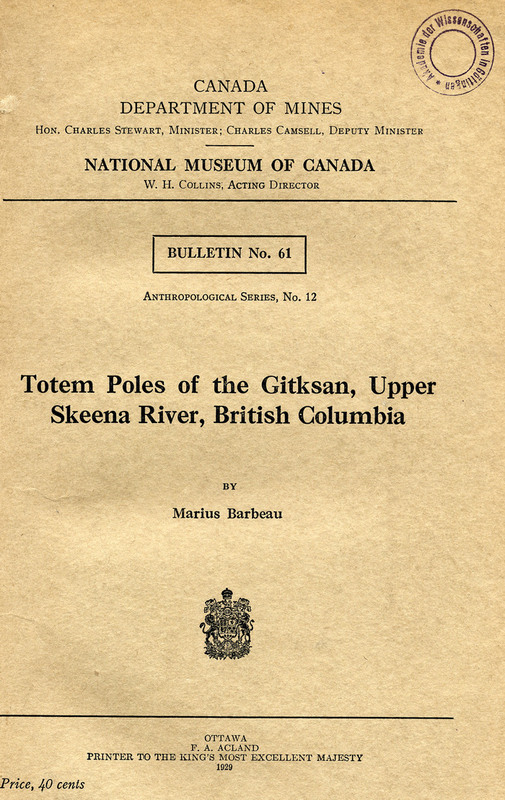 Some 40 years later Marius Barbeau, an anthropologist at the National Museum of Canada (today the Museum of Civilization), visited the Skeena River communities to conduct research on their totem poles in 1924. He was accompanied by the artist W. Langdon Kihn, who provided documentary representations of the Gitxsan communities and people. One portrait he painted was the matriarch Hanamuh Kisgahast of Kitsequkla (also known as Fanny Johnson), whom Barbeau said was "the cause of the Skeena River Rebellion" (right). Her crests, he reported, were the Stars, the Moon and the Rainbow. The article on the Skeena River Revolt reported: "The local militia is prepared to start for the scene of the outbreak on short notice. A messenger arrived from Hazelton last night. He says when he escaped the Indians were still laying siege to Hudson's Bay Fort, where all the white population are gathered. The garrison, he says, could not hold out much longer, and he fears that troops now on the way there will not arrive in time. General Middleton, who commanded the troops during the last rebellion, has again been called upon to direct the troops in this revolt. He has wired the military authorities in BC as follows 'Can put 5,000 men on cars in 24 hours en route for scene of outbreak'." Left: Book edited by Wilson Duff. In 1958 Duff travelled to Kitwancool, representing the BC Provincial Museum's Totem Pole Preservation Committee, to negotiate with the chiefs about removing some of the totem poles. Duff writes in the preface: "The authors of this book are the Kitwancool themselves, for it contains their own statement of what they consider to be their histories, territories, and laws. It was their idea in the beginning that such a publication should be produced." Like the people of Kitsegukla, the Kitwancool resisted government efforts to restore and relocate their poles on the new railway line as tourist attractions. Right: A view of Kitwancool taken in 1910 shows how the poles face the Skeena River. A similar photo appears on the cover of an 1958 book by Wilson Duff (above), where he describes the importance of the poles: "The chiefs established themselves at Gitanyow and raised their poles. The poles gave them their power or coat of arms and gave them the right of ownership of all the lands, mountains, lakes and streams they had passed through or over and camped or built village in. The power of these poles goes onto the lands they had discovered and taken as their own." The original name of Kitwancool was Gitanyow, or the "place of many people," but after a killing raid, it was renamed to mean the "place of reduced numbers." Kitwancool people distrusted outsiders and government authorities and until the late 1920s, their territory was left largely undisturbed. 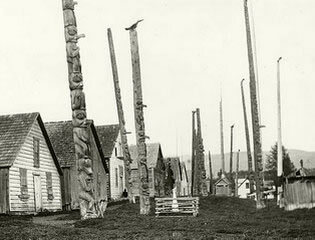 Totem poles in Kitwancool, 1910. According to Marius Barbeau, carvings by the Kitwancool artists Hesem - hliyawn, Nees - laranows and Hlamee were "on a par with the best ever produced on the Nass; that is, they are nowhere surpassed in excellence. Hseemhliyawn and Nees - laranows lived as late as 1888, and Hlamee, their follower, died after 1900. 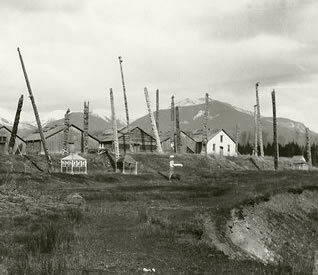 No less than twenty poles from their hands still stand in the three lower villages of the Skeena; seven are ascribed to Haesem - hliyawn, three to Nees - laranows, and ten to Hlamee. To Hsesem - hliyawn, the outstanding figure in this school, goes the credit of carving some of the best poles in existence, for instance, the Wholethrough (Wulnaqaq) 4 of Haidzemerhs, and the Sitting - Grizzlies of Malee, 6 both at Gitwinlkul; the poles of Weerhae, at Gitwinlkul 6; and the Mountain lion pole of Arteeh 7 at Kitwanga. His was a fine style, in the purely native vein. He combined a keen sense of realism with a fondness for decorative treatment. Tsimsyan art in his hands reached one of its highest pinnacles. It sought inspiration in nature, while maintaining itself within the frontiers of ancient stylistic technique" Totem Poles of the Gitksạn. "Gitwinkool Totem Poles," c. 1924. Marius Barbeau continues his praise: "Haesem - hliyawn belonged to the generation wherein the totem pole art was still in its growth (1840 - 1880) and all at once reached its apogee. His handling of human figures counts among the outstanding achievements of West Coast art — indeed, of aboriginal art in any part of the world. The faces he carved, with their strong facial expression and amusing contortions, are characteristic of the race. Many of them are sheer masterpieces. From a purely traditional source, his art passed into effective realism. His treatment of birds and spirit-monsters is not inferior to that of the human figure" Totem Poles of the Gitksạn. Totem poles at Kitwanga, 2008. Above: A recent photo of the totem poles at Kitwanga shows the government plaque erected in 1967 as a tourism attraction. Its racist text (i.e. 'primitive' art) reads: "These stately monuments in cedar proclaim the owner's clan status and inherited family traditions, but were never associated with religion. Clan crests protrayed mythical creatures, sometimes in human form, from the legendary history of the clan. As a unique primitive art form, the poles are fitting examples of the artistic talents of these native people." 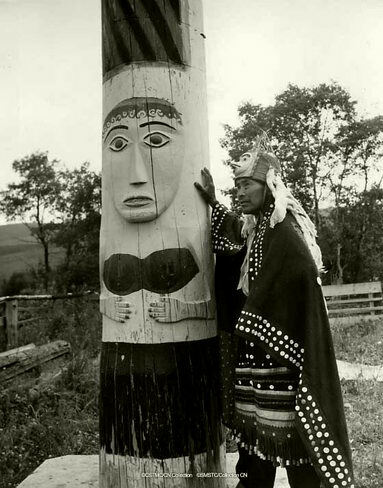 Starting in the 1920s the totem poles of Skeena River were used by Canadian National (CN) and the government of Canada to increase tourism. Many Gitxsan hereditary poles were "collected" either by outright theft or by paying the owners a pittance. For instance, the 40 ft high "Bear Mother" at Angyedae on Nass River was removed by CN in 1930 to be given to France where it stood as a symbol of Canada at the grand entrance of Musée de l'Homme in Paris. 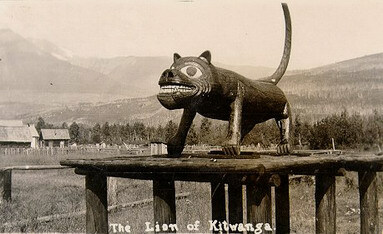 Lion and poles, Kitwanga, 1925. Battle Hill, site of Kitwanga Fort. Wilson Duff recorded some important oral Gitxsan interpretations of the poles at Kitwanga from Chief Wee - kha in 1958. The Will - a- Daugh Pole seen in detail below: "The bird on the top is the Giant Woodpecker . . . the figures around the top of the pole are the house carvings; next is the large bird Skim - sim, the mountain eagle; fourth is a row of carvings representing children or small people, the ones who fish through holes in the ice (the holes may be seen in the front of the house); the figure at the bottom of the pole, holding the child, is the important figure. The name of the pole is Skim - sim and Will - a - daugh. On these two depends the history of the pole. It holds many legends of the clan" (below). 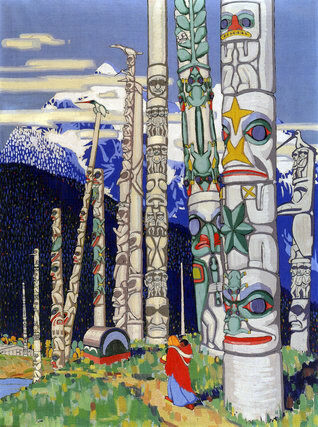 The artist Emily Carr painted this pole during a visit in 1928 (below, right). Located on on Battle Hill above the banks of the Kitwanga River, Kitwanga Fort was a fortified village occupied during the late 1700s and early 1800s by the Kitwanga people (left). "A famous occupant of the site was warrior 'Nekt who fought to establish control of the network of lucrative trading trails in the Skeena, Kitimat and Nass region." Today it is protected as a national historic site: Gitwangak Battle Hill. 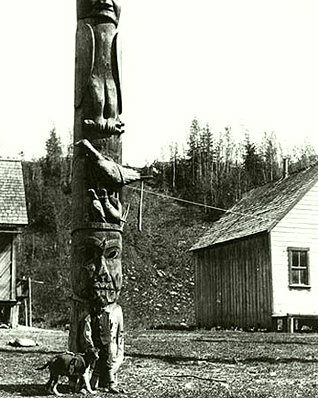 Totem pole at Kitwanga, c. 1928. 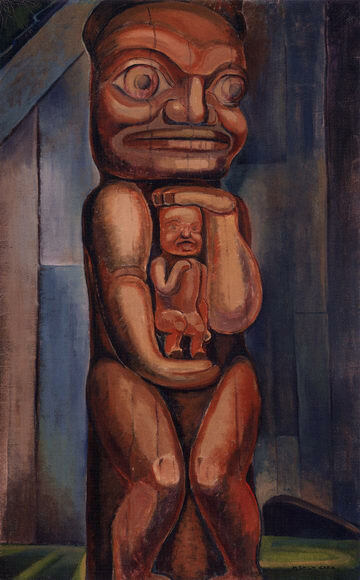 Right: "Totem Mother, Kitwancool" Painting by Emily Carr, 1928 (Vancouver Art Gallery) Emily Carr incorrectly believed that Northwest Coast Indians were "a passing people with a vanishing culture." Her aim was to preserve a vision of their totem poles: "And so I have gone about my work making this collection of Indian totems and I am not through yet . . I glory in our wonderful West and I [would] like to leave behind me some of the relics of its first primitive greatness. . . Only a few more years and they will be gone forever into silent nothingness . . ." Lecture on Totems, 1913. Left: Detail of a replica totem pole at Kitwancool, painted by Emily Carr in 1928. Collection: Vancouver Art Gallery. The totem pole, titled "Skim-sim and Will-a-daugh" belonged to Chief Wiha 28 (Wee-kha, Ernest Smith), chief of the Wolf (Gilt-Winth) clan. 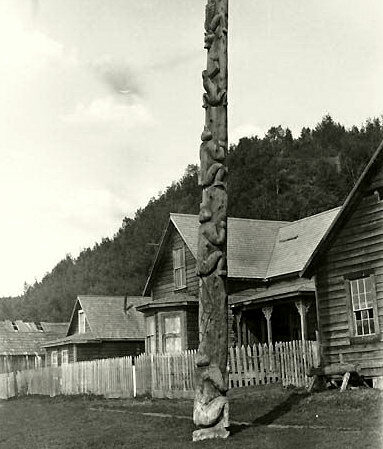 Gitxsan pole at Kitanmox, 1909. 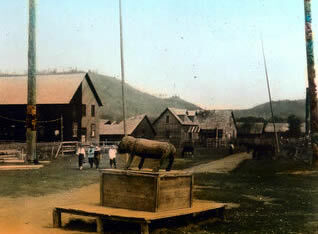 The totem poles at Kitanmox (also known by its colonial name of Hazelton) were photographed by visiting anthropologist George Emmons in 1909. According to Marius Barbeau, the pole featuring climbing bears belonged to Kwawhadaq and was carved by Gitmeraldo. It was called Place - of - Climbing or Place - Where - Bears - Cool Off (left). Other figures are the Wolf - Cut - In - Half. The black two bears and their two cubs are climbing around the pole together; the Shadows - of - Trees, painted in black between two bears with two parallel lines enclosing three circles. In 1883 Git chief Gyetim Galdo'o of Gitanmaax openly held a potlatch, a traditional form of First Nations governance banned by the government of Canadaa, and as a result was arrested by the Royal Canadian Mounted Police. Gitxsan traditions are express a perception of nature in which the world is not separated into human spaces and wilderness, instead, all is one. People have a sustainable and long-term relationship with the land as well as strong communal values. Gitxsan landscape perception is part of a study by Leslie Main Johnson: "Gitksan landscape perception is organized with reference to mountains and rivers, to drainage basins and divides. These orienting perceptions are bound up with the territory system, where the landscape, including drainage basins, slopes of mountains, and river fishing sites, are delimited as owned properties of House groups." Art Mathews (Dinim Gyet, a Gitksan Lax Gibuu, Wolf Clan, Chief) was recorded on how totem poles express the sacred connection to the land. "A totem pole bears a series of crests, which are iconic emblems of events in the history of the ancestors of the Chief. 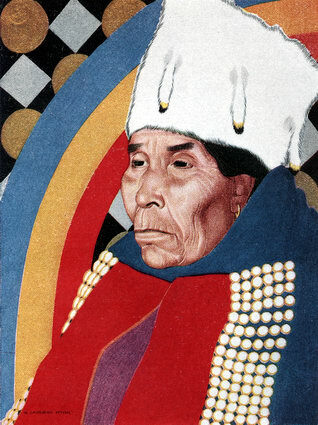 The Chief (Sim'oogit or Sigidimnak) wears his/her chiefly regalia, which also bears crests emblematic of the ancestors, and sings songs or tells histories which attest to the long relationship of the people with their territory. The other chiefs and people who attend and assist with the pole raising, and come to the pole raising feast, validate the relationship symbolized by the displayed crests and dances and recited histories and songs, and act as witnesses to the implicit compact between the people and their land. The land takes care of the people, who in turn, through their respect and use of the resources, take care of the land and enable the cycle to continue" Leslie Main Johnson: A Place That's Good. 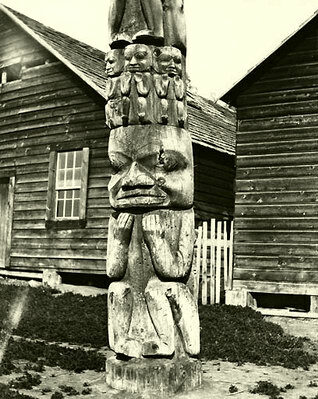 Totem pole at Kitanmox, 1909. 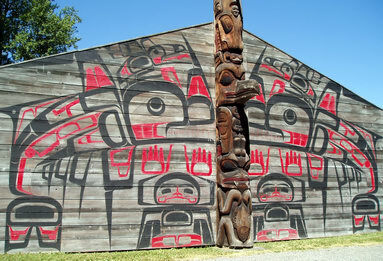 House front at 'Ksan, 2006. 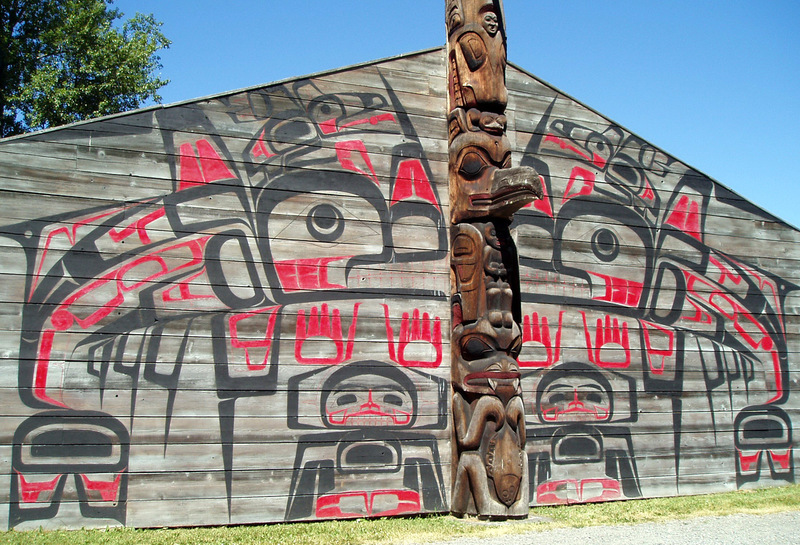 'Ksan is the home of the Gitanmaax School of Northwest Coast Art. One of its founders was Gitxsan hereditary chief Walter Harris (Chief Geel). Ya'Ya (Chuck Heit) pays tribute to him: "K'san was created to counter the damage done by 100 years of brutal colonial assimilation. Throughout the 19th century the west coast of Canada had been ransacked by collectors and museums from around the world. They robbed graves and homes and dead bodies for anything and everything. Very few traditional objects remained in Indian possession. The Gitxsan ability to produce these cultural necessities had completely died out. But in 1969 Chief Geel and all the Gitxsan Chiefs, and a few white neighbors started to change the course of that history. They built K'san" Gitxsan Art: Walter Harris. Today tourists from all over the world visit 'Ksan and learn about Gitxsan culture (right). "Totem poles are read from the solid base at the bottom to the top figure, as it points skyward . . . The top figure on the totem pole is not the most important, it is the figure on the bottom that carries the most weight" Totem Poles of 'Ksan Historical Villag. 'Ksan Historical Village and Museum (left) is located near the ancient Gitxsan village of Gitanmaax (People of the Place of Fishing Torches), at the confluence of the Bulkley and Skeena Rivers in the community of Hazelton. Entrance to the Wolf House, 'Ksan, 2007. Totem pole at Kitsukalem, 2008. 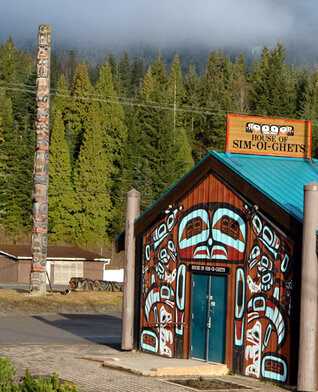 The Kitsumkalem Community Centre and "House of Sim - oi - Ghets" (Tsimshian for House of Chiefs) was rebuilt to resemble a traditional long house in 1996 (right). An enormous totem pole (above) stands across the road from the Centre. 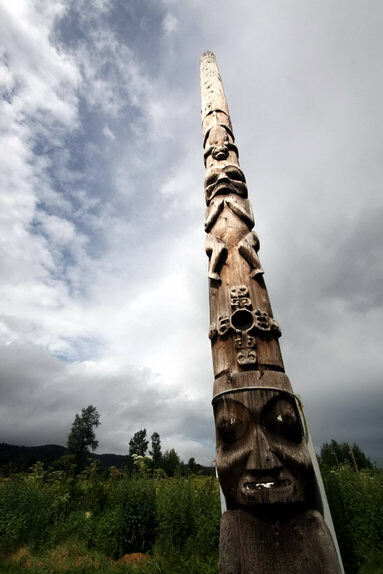 Many of the most spectacular totem poles on the Northwest Coast were said to have been located at Kitsumkalem, although none were erected for over a century until 1987, when two "Su-Sit'aatk" crest poles were raised during a traditional potlatch and chief installation ceremony. 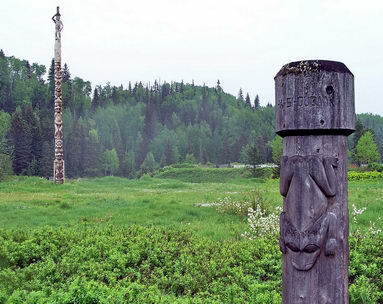 A monumental totem pole marks the community of Kitsumkalum (left). "We are the People of the Robin, the Kitsumkalum, a galts'ap/ community of the Tsimshian Nation living near the City of Terrace in northern BC. . . Our traditional properties and estates are in the land around Kalum Mountain and the entire Kitsumkalum watershed. We also have heritage sites and resources down the Skeena River and in coastal areas" Kitsumkalem. 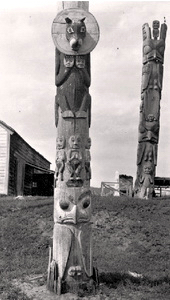 The two poles were carved by the Haida artist Freda Diesing with assistance by Kitsumkalum carvers. 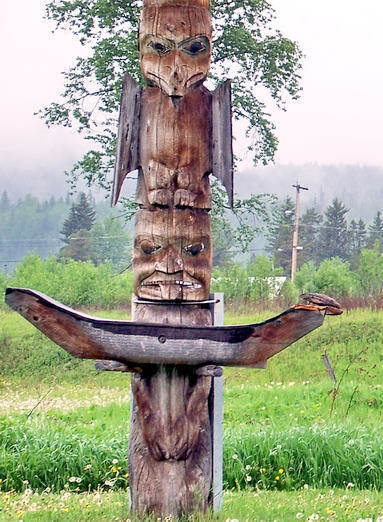 One pole was carved in a modern style and represented the community and its future; the other was a replica of an older pole with ancient family crests and represented respect for the past. According to Chief Cliff Bolton, the totem poles were "his generation's way of telling the children that the next generation will have to be prepared to fight for the survival of their culture" Su-Sit'aatk. 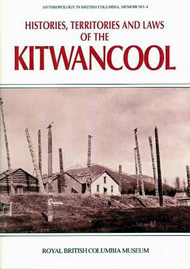 Anthropologist James MacDonald describes how Kitsumkalum culture "is not a dead archive of traditions and customs frozen in the past" and discusses "the connection between Kitsumkalum’s Tsimshian heritage and the territory which nurtures that heritage" in his book: People of the Robin (right). See also: Return to Robin Town (Living Landscape, Royal BC Museum). "People of the Robin," James MacDonald, 2003. Tsimshian villages were originally founded in Kitselas Canyon for the purpose of procuring, processing and storing large quantities of salmon. Later the canyon inhabitants controlled the flow of trade goods along the Skeena River. At the time of first contact with Europeans, about 600 people lived in the villages of Gitsaex and Gitlaxdzawk. Following a smallpox epidemic in the 1860's and 1870's, the villages were abandoned: Historical Villages of the Gitselasu. House posts, Gitlaxdzawk, c. 1912. 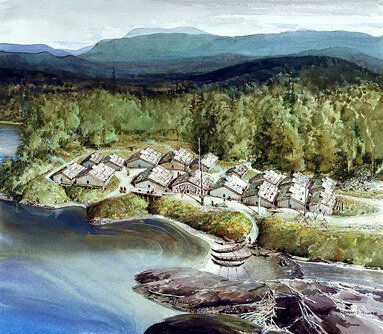 The Tsimshian village of Kitselas, the "People of the Canyon," was inhabited until about 1885: Gitselasu. The village was originally divided into two parts, Gitsaex (left) and Gitlaxdzawk, which faced each other across the Skeena River. Kitselas Canyon is the first major constriction of the lower Skeena River and archaeological evidence confirms that it has been an important aboriginal fishing station for at least 5,000 years. House post at Gitsaex, 1909. 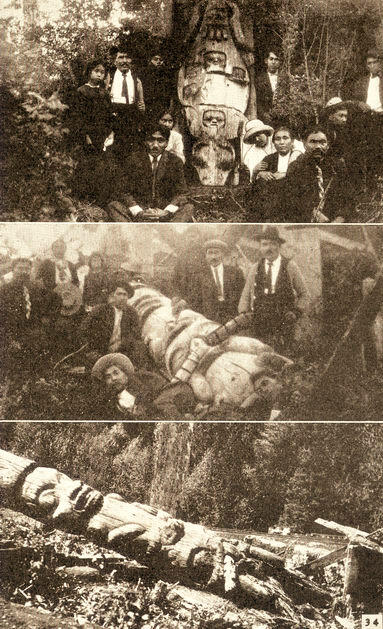 Left: In his classic 1929 book on totem poles, anthropologist Marius Barbeau published three photos taken c. 1912 of Kitselas band members and the Peleqwa Beaver House Post of Sim'oogit lyoos at Gitaxdzawk: Totem Poles of the Gitksạn. From the Kitselas website: "The name of the village of Gitlaxdzawk according to the elder Paul Mason means the 'people of the place where they steal canoe bottom boards.' This name refers to the fact that the village was a fortress overlooking the river and that their enemies. The name Gitlaxdzawk has also been given the meaning 'people of the ravine' and the 'fortress.' 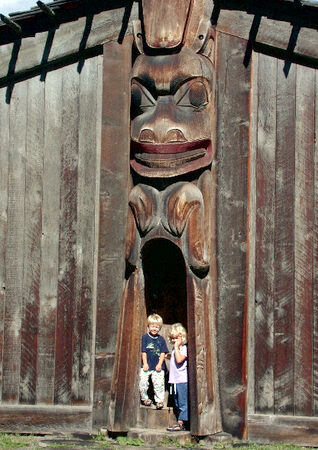 This village had ten large longhouses and many totem poles. The largest house belonged to Sim'oogit Gaum, a Chief of the Raven, or Ganhada clan. This house measured around 14 metres square. The village would have been home to at least 300 people" Traditional Territory of the Gitselasu. The Canadian government supported a cultural tourism initiative along with Kitselas First Nation: Kitselas Canyon National Historic Site. It opened in 2007 with the raising of two totem poles (below). Such a belated gesture by the government fails to recognize its injustice to the Gitxsan and tribute hard fought Gitxsan resistance that is inseparable from the land: Gitselasu Territory & Reserves. 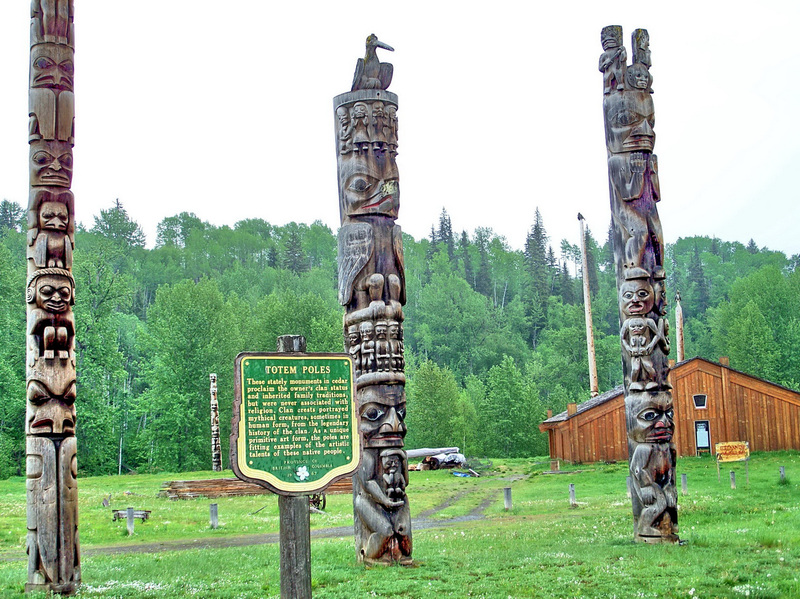 On 10 August 2007, a Grizzly Bear Pole and a Beaver Pole carved by Stan Bevan and Ken McNeil and their Gitxsan assistants were raised at the Kitselas Canyon National Historic Site (right) and the longhouse designs of Eagle, Raven and Killerwhale were unveiled: Kitselas Totem Poles. "Honouring Our Ancestors" by Stan Bevan, 2008. Kitselas pole raising, 10 August 2007. 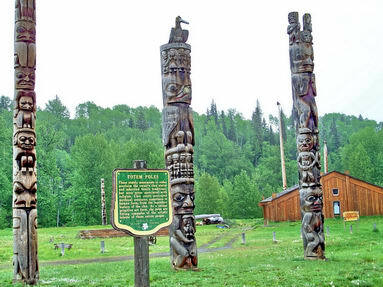 On 4 August 2008 four new poles carved by Stan Bevan were raised on to celebrate the "Honoring Our Anscestors (left). 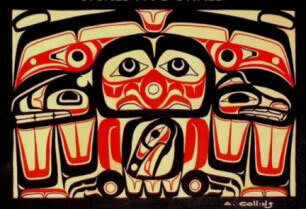 The crests are those of Wolf (Laxgibuu), Eagle (Laxsgiik), Raven (Ganhada) and Killerwhale (Gispudwaada). "In Tsimshian culture, a story is told in oral form, in written form from crests, and from symbols such as totem poles [which] focus on some of the clan histories, or adaawak, of the high ranking families who owned the houses, poles and the surrounding territories of Gitlaxdzawk" Art Making Tradition.